A Tag Barrel from Donkey Kong 64. 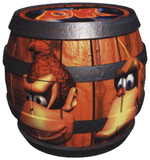 Tag Barrels are barrels that appear in the game Donkey Kong 64. Tag Barrels can be found in every area of the game and are used to switch between Kongs. Before getting any of the Kongs, the barrel has question marks in place of their faces. As Donkey Kong finds his Kong friends, their faces will appear on the barrel. There are usually five or seven in every level of the game, but DK Isles has ten of these (eight in each level lobby, one in the main area, and one near Snide's H.Q.). If a Kong jumps into the barrel, the screen turns black and the selected Kong is underneath a spotlight. Each Kong acts as if they want to be selected, and shows disappointment if they are not. For example, Chunky Kong tries to capture the player's attention by shouting "Yoo hoo! ", but acts cowardly if chosen and wants the player to select Tiny Kong. If the player moves to another Kong, he is relieved. A similar kind of Barrel appears in Donkey Kong Country: Tropical Freeze, where it spins between the DD, DX, & CK emblems (this Barrel only appears in single player, as all DD, DX, & CK Barrels are replaced by the normal DK Barrel). When highlighting Donkey Kong or Chunky Kong inside the Tag Barrel, the instruments playing in the background are the ones from the DK Rap (muted trumpets for DK, timpani for Chunky), instead of their musical instruments they get from Candy Kong. When Tiny is selected, the saxophone plays the theme of Ticker's Tower from Banjo-Kazooie. Also titled "Jungle" by the composer of both Banjo-Kazooie and Donkey Kong 64, Grant Kirkhope, this theme was originally composed for Mumbo's Mountain with Ticker's Tower being an area within the level, still keeping its original theme after the level's theme changed. This page was last edited on December 16, 2018, at 15:35.